$100 Old Navy eGift Card Giveaway! 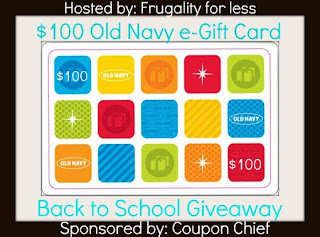 Coupon Chief and Frugality for Less have teamed up with a great group of bloggers to bring you this awesome Back 2 School $100 Old Navy E-Gift Card Giveaway! We all know back to school time is tough and so why not give our awesome fans a chance to win and make school shopping this year a little easier on the pocket book! Coupon Chief is sponsoring the prize and if you don't know who they are, make them your first stop before shopping online! Coupon Chief has all the latest coupon codes for online shopping. Oh yeah, you can even make money by sharing coupon codes you find. Make money by helping others save money, it's that easy! This giveaway is open to US residents only. Giveaway will run 8/9/12 at 9pm EST and will close 8/16/12 at 11:59pm EST. One winner will receive a $100 Old Navy e-gift card. Only entries on Rafflecopter form below are valid. GOOD LUCK! I plan on getting my kids some back to school clothes. Will some cool clothes for my hubby for his birthday. Love Old Navy Jeans! I plan to buy a few cute fall pieces at Old Navy if I win. I would probably buy some sticking stuffers for my kids and grand kids.